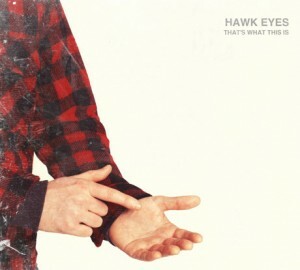 Hawk Eyes’ 2013 release ‘That’s What This Is’ was funded by fans via a kickstarter campaign – and for the fans, their money was well spent as the Leeds math/alt-metal outfit offers another selection of tunes which manage to combine difficult and angular aggressiveness with moments of surprising melody. ‘This Is What That Is’ has a fantastic intro, as the drum line beats incessantly as if the kit is being approached in the manner of a man smashing through a door with a hammer, which is then complimented perfectly by a clanging and slightly discordant riff. As the band settle into their main assault, there’s an unexpected melodic element complimenting an equally surprising hooky chorus. Despite the melody, the edges of Hawk Eyes’ math rock/alternative sound remains uncompromisingly sharp. For those able to tune their ears past the brilliantly aggressive chugging guitars, there’s the contribution of an extra fat bass, thickening up the band’s sound considerably. As with the best of their previous work, various influences can be heard – and inevitable comparisons made – Hawk Eyes nail that difficult task of taking a bunch of influences and working them to their advantage, without sounding like a cheap imitation. ‘Never, Never, Just Not Now’ attacks with a similarly deceptive sense of melody lurking beneath the QOTSA-esque wall of sound, and more than before the brilliantly English sounding vocals sound completely at ease against a relatively discordant backdrop. After a few spins, it becomes more obvious that the clanging chords pitched against a hard drum resembles Faith No More’s ‘Naked In Front of the Computer’; this may or may not be entirely intentional, but it’s a superb sound nonetheless. Tapping into something a tad more commercial (though that concept is relative), ‘More Than A Million’ utilises a bouncy riff, before dropping back to allow the vocal to stretch over a solid alt-rock backdrop. Hints of Foo Fighters in the vocal melodies dance against a typically metallic base, showing Hawk Eyes as a band that understands the very fine lines between aggressiveness and harsh melodies perfectly – and judging by the guitar solo that fuses electronic sounding noise with a Page Hamilton inspired thrashiness, they’re keen to exploit it at every turn. ‘…Million’ may well be a little catchier than the more typical Hawk Eyes stuff, but – surprisingly – it’s still not their best offering. The EP’s best track is a little less spiky than the others, but what ‘Cheap’ lacks in sharp edges it makes up for in distortion. Verses comprising muted chords and quasi-melodic voices lean towards something that instantly pulls in the listener. Holding things together, a solid drum line includes a brilliant off-beat – and when they’ve got you, there’s no chance of escape as a barrage of crashing drums and fuzzy bass appear unrelenting. While this is a bit less typical of the Hawk Eyes sound present on the other three tracks, its heavy uncompromising approach is stellar – but then, the mix of screeched and angry vocals with a heavily distorted bass sounds so much like Helmet, there was little chance of it ever failing to be anything less. Four songs of anger, discordance, angular melodies and noise – glorious, wonderful noise…that’s what this is. Hawk Eyes are ferocious, commanding and brilliant. Don’t miss this disc – and be sure to pick up their 2012 release ‘Ideas’ while you’re at it. This entry was posted in alternative and tagged alternative, hawk eyes, leeds, math rock, rock by Real Gone. Bookmark the permalink.